Norco Truck Accident Injury Lawyers – Our Expert Injury Lawyers Associated With Trust and Experience! Have You or a Loved One met With a Truck Accident or Car Accident in Norco, Riverside, California? Our truck accident personal injury and wrongful death lawyers in Norco, Riverside, California will assist you in recovering compensation for your damages. The entire process of collecting or filing for damages can be a difficult one, but with personal injury legal expert attorneys by your side, rest assured that every worry or concern will be taken care of. Whether it’s a truck accident, a car accident claim, a serious personal injury, uninsured motorist (UM), or even a wrongful death claim, we can help you and your family make your rightful claim. Our truck accident injury lawyers possess more than 40 years of experience in handling claims for truck accident injuries and representing families in wrongful death claims. You can learn more about our Norco & Riverside truck accident personal injury & wrongful death law firm by visiting our home page, our lawyer profiles, and our personal injury & wrongful death case testimonial pages. In addition, while we urge you to contact us for a FREE evaluation of your own truck accident or other personal injury claim, you also may get some quick general truck accident advice by visiting our Truck Accident Injury Advice Section. Norco is a city in Riverside County, California. The city was named after the North Corona Land Company and the name Norco is an abbreviated term for North Corona. The city’s population increased to an estimated 27,063 according to 2010 Census, while it was only 24,157 in 2000. Norco has a total area of 14.3 square miles of which 14.0 square miles is land, and 0.3 square miles or 2.22% is water. The 2010 Census also reported that the population density of this city was 1,895 people per square mile. There are approximately 7,023 households, out of which 2,831 had children living in them under the age of 18. The major area-employers in the city of Narco are the Corona-Norco Unified School District, the California Rehabilitation Center, and Naval Surface Warfare Center. Because of their mammoth size and weight, a truck is perhaps the most dangerous vehicle that can be involved in a road accident. Truck accidents can have fatal and tragic consequences, especially for the occupants of the vehicle that collides with a truck. For instance, if an 18-wheeler truck that weighs around 40 tons goes even a little bit above the legal speed limit, it can be much more difficult for it to pull over or stop. This can result in truck jackknifing or otherwise going out of control and colliding with one car or multiple smaller vehicles. According to the recent California statistics, more than 12,000 commercial and semi trucks have been involved in non-fatal accidents in just one year. In addition, more than 5,000 truck accidents resulted in serious injuries. The number is as high as 5,000 for these types of accidents that lead to fatalities because of California’s extensive interstate highways, and most of these accidents occur in and around freeways in the Golden State. This number is shockingly high, considering that many of these accidents could have been avoided if the truck driver was well rested, not distracted by cell devices and just wasn’t negligent and if the large trucks had been properly maintained. Our Norco truck accident lawyers are here to help and assist you at every step of your claim. If you or your loved one was hurt or seriously injured in a truck accident, please seek immediate assistance from our attorneys and Law Corporation as there are many time deadlines and procedural rules for which you must comply. 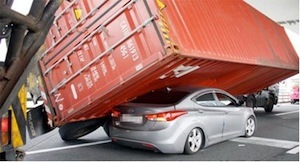 Our truck accident personal injury lawyers will do the utmost to assist you in this legal process. For truck crash or other personal injury claims or a wrongful death accident claim in Norco, Riverside, Los Angeles, Burbank, or any other place in California, please get in touch with our truck accident injury lawyers and our legal team now for a completely FREE CONSULTATION and case evaluation. To speak with our experienced truck accident injury lawyers or any member of our legal team, you can call on 818-222-3400 (after hours, please press 1). You can also call us on our Toll-Free number 866 INJURY 2 or 866-465-8792 (after hours, again please press 1). You can also easily Contact Us by clicking here or by emailing us at info@WalchLaw.com! REMEMBER: With our Truck Accident and Car Accident Personal Injury Lawyers, the Consultation is FREE and there is NO fee until you WIN!